Thanks to Ryan Mo, I get to test drive the new Honda Jazz Hybrid and also get a feel of driving the Honda Insight as well last weekend. Located at Kajang, the service center that I traveled to for the experience is quite a distance from where I live. But the journey to get a feel of the new car other than driving my trusty old Proton Iswara was well worth it. Since I AM scouting for a new car, this will give me the perspective on what my driving habits are and what car is to my liking and my dislikes. The service center started operating on Sundays as well since April 8, 2012 from 8am - 1pm where it contains 20 service bays and can service up to 200 cars per day. 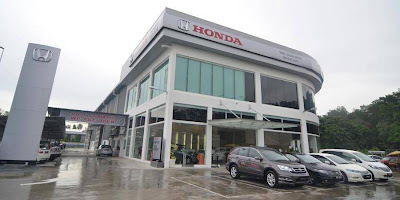 Besides servicing the Honda cars (which they also do Fuel Injector cleaning. 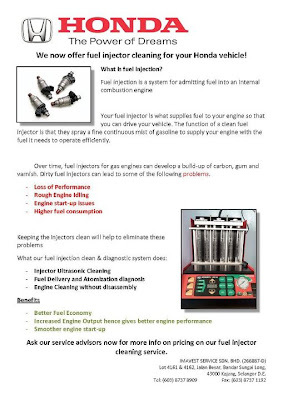 Refer to the leaflet attached below), they also offer Insurance Renewal (MSIG) for any cars at all. Anyway, back to the driving of the Jazz Hybrid and Insight. Being fairly new in driving another car other than my Proton Iswara, I took quite some time getting use to the brakes of the Honda Jazz Hybrid as I don't need to depress as much to achieve the desired braking point. The econ mode which is a green button located on the bottom right of the steering wheel and dashboard helps save fuel consumption, reduces emissions and increase the IMA (Integrated Motor Assist) battery recharging rate. In the end, when you have collected enough 'leaves' through your driving, it will turn into a trophy. What a fun way to encourage drivers to be more eco-friendly and yet, somewhat distracting. LOL. Whenever you brake and come to a complete stop, the car will auto stop (indicated on the speedometer as well) and it will use less battery power. Effects you'll feel would be the engine quiets down and the air conditioning will not be as cool. Be prepared to face this in traffic jams. There are also paddle shifts on the steering wheel to make you feel like an F1 driver because the usage of this is to change gears at your fingertips. The car, powered by a 1.3L i-VTEC engine has minimal blind spots, has a spacious back seat and feels smaller in size when compared to my Iswara. Also, can't really the front. It's as if, there's no car head! The next car I test drove was the Honda Insight. This is also a hybrid electric vehicle and of course is equipped with the same function of econ mode just like the Jazz Hybrid. The interior at the front feels more spacious and I can see a bit of the front hood. However, I dislike the back which I can only see a small window to the outside. This could be hazardous to my driving as I depend on the rear view mirror more than my side mirrors. This time, I push the car more and see how fast it accelerates and don't bother about the econ save mode thing. It's fairly good in acceleration (although I still prefer my Iswara. But then again, my Iswara's a 1.5) and the brake is not as sensitive as the Honda Jazz Hybrid which I got used to immediately. More or less it's the same features as the Jazz Hybrid with the exception of some like the paddle shift in the Jazz Hybrid just the different feel of driving on both vehicles. The Honda Insight's price is starting at RM99,800 as of now. 15 - 20 May @ Alamanda, Putrajaya. Vouchers will be given out for free engine oil to Honda owners so check it out. Very impressive car,Honda always launch luxurious car like City,Civic,CR-V and Jazz.Honda jazz has amazing look and superb style. Sometimes it's distracting though. LOL. I saw one nearby my house.. Look cool! It definitely has the sporty look.